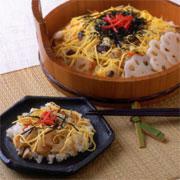 A traditional Japanese party dish made with a very healthy combination of ingredients. Place the shiitake, stems removed, gourd (cooked according to Thin Rolled Sushi recipe), and A in a pan; bring to the boil then lower the heat and cook for 15 minutes. Cut the cooked shiitake into 5mm cubes. Cut the cooked gourd into strips, 1cm. Peel the lotus root, cut it in half and slice one half to reveal it’s floral impression. Cut the other half lengthways in quarters, and then cut each quarter very finely (3mm width). Soak all of the rootin vinegared water to remove harshness. Boil the flower shaped lotus root for 2 minutes and then marinate in B.
Wash the burdock root and scrub off the skin. Shave-cut the burdock root with a knife. Peel the carrots and cut into strips, 3cm x 2 mm. Heat the oil in a pan and fry the burdock root, carrot, and the finely chopped lotus root. When cooked, add C and continue cooking until the sauce is reduced to nothing. Beat the eggs gently with a pinch of salt, and pour a small amount into a heated, lightly oiled frying pan to make a thin sheet of omelette. Make a few sheets, roll them on a chopping board and cut into very fine strips, 2mm. Mix the rice and other ingredients ‘lightly’ with a wooden spatula to avoid crushing the rice. Mix the sushi rice with the shiitake, gourd, burdock root, carrot, finely chopped lotus root and toasted sesame seeds, and serve on a plate. Garnish with the flower shaped lotus root, strips of omelette, nori and red pickled ginger.